"This is one of the most expressive Ōsaka bust-portraits. 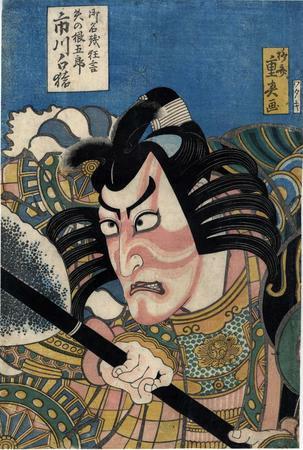 The face with beniguma make-up, shown in a mie or fixed pose, is in the centre of the print, with the line of the shoulders as high as Hakuen's hairknot. This excites the idea that the actor bends to the front. The multi-coloured pattern on the clothes, in combination with the make-up and the complicated coiffure (a kuruma-bin wig) create a poignant effect against the plain background at top. In strong terms they portray the atmosphere of the aragoto-style of acting. The scene is one from a performance in which Hakuen played five different roles, related to five different plays. These roles have been interpreted in a dance and the one represented here is from the famous play 'Yanone', in which one of the highlights is the sharpening of arrowheads. It concerned a farewell performance on the occasions of Hakuen's announced return to Edo. The actor used the name Hakuen temporarily in 1829 and 1830. He is better known as Ichikawa Danjūrō VII." Quoted from: Ōsaka Kagami 大阪鏡 by Jan van Doesburg, p. 70. This is accompanied by a full-page black and white illustration on page 71. 1) a full page color reproduction in Schwaab's Osaka Prints on page 141. This print commemorates a performance at the Naka Theater in the 9th month of 1829. 2) a full page color reproduction Schätze der Kamigata: Japanische Farbholzschnitte aus Osaka 1780-1880, MNHA (Musée national d'histoire et d'art Luxembourg), p. 137, #49.